Brian Allen and Ron Glatley formed the basis of the band in the early 70's in Barrie, ON. They went through a variety of incarnations of 'the flavour of the day' images before settling on Rose, a hard-nosed sound heavy on guitars with a powering backbeat. A chance meeting with Ronnie Hawkins during a Toronto show led them to his manager, Milt Brodie. Brian Allen remembers, "He managed both us and Ronnie. Ronnie liked us and helped us get a few gigs here and there." They played the circuit doing covers while finding time to record some demos at Toronto's Eastern Sound. With Gary Lalonde returning on bass (after briefly being replaced by Ian Kenzie) and drummer Ken King they were signed to GAS Records in '73. British emigrant, John Stewart - whose resume included the likes of Deep Purple was brought in to work over the band's material with engineer Tom Brennand. 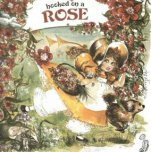 With Allen writing all but 3 of the songs (Lalonde - 2, Glatley - 1) HOOKED ON A ROSE was released later that year in a raw and energetic debut. Tracks like the lead-off "Long Lonesome Road", "Hex" and "Wonder Wings" gave us a taste of the fret-work Allen would become synoymous with. But financial problems within the label caused its demise the next year. They gained the songs' rights back and manufactured the records themselves, selling them with 'very funky homemade artwork' in local shops and at the concerts. They continued working on demos at Eastern Sound over the next few years while building on a strong loyal following around the circuit. With new drummer James Fox, they continued shopping their demos to every label around, signing with Polydor in the fall of 1976. 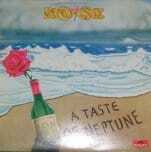 A TASTE OF NEPTUNE was released the spring of '77. 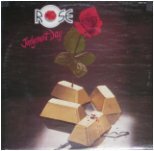 Produced by Fraser Kaufman at Phase One Studios, the album was a collection of 9 progressive rock tracks, all written by Allen except for Glatley's "Snakes & Ladders". From the opening licks of "Ride Away" to "Bangin' My Head Against The Wall " to the title-track that ends it, the record was full of energy and zest. Respectable sales warranted a cross-country tour for the better part of the year. They returned to Phase One and before the end of the year JUDGEMENT DAY was in the stores. Made up in large part of material which didn't make the first record, again Fraser Kaufman returned behind the controls. Under pressure from 'the suits' to produce a hit, they called on Annie Woods (ex of Sass and Gambler) to guest on the first single "Johnny Law". Again Allen wrote the majority of the material, including the roaring lead-off "Between The Lines", the title-track and "Dealer". Other noteable songs include "Recession - Depression" and Lalonde's "Tender Is The Night". Although the album got a fairly positive response across Canada, they were unable to land an American distributor. The label dropped them after a second cross-Canada tour in '78. But before long Allen and Fox were back on the scene, hooking up again with Woods, now going by the first name of Holly. Along with Allen's future wife Sheron Alton, Nick Costello and Scott Kreyer (Sass/Gambler) they formed Toronto and became one of Canada's biggest-selling groups of the 80's. Lalonde meanwhile would also appear on record with Toronto on '83's GET IT ON CREDIT before joining Honeymoon Suite a year later. After leaving the band in '84 Allen would go on to great success as a producer/engineer, including working with Lee Aaron, Haywire, Santers, The Nylons & Zappacosta. As well as working with A &M Records and now heading up AMPLUS Productions, Allen and Alton also wrote for many others after Toronto, including ironically their biggest-selling single ever - "What About Love". Though originally intended to be included on a Toronto record, it was Heart who scored a #1 with it in 1985. The original Toronto version remained unreleased until 2002.